Typically, V-belts and V-ribbed belts are used with mating pulleys in drives where speed ratio is not critical. V-ribbed pulleys are often used with mating belts for efficient, very high speed power transmission. Belt cross-section is an important parameter to consider when selecting V-belts and V-ribbed belts. Published dimensions may vary. 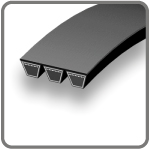 Choices for V-Belts with English Cross-Sections include O / 3L / Z, A / 4L, B / 5L, C, D, E, 3V, 5V, and 8V. Choices for V-Velts with Metric Cross-Sections include SPA, SPB, SPZ, 5 mm, 6 mm, 8 mm, 10 mm, 13 mm, 17 mm, 20 mm, 22 mm, 25 mm, 32 mm, and 40 mm. Choices for Ribbed V-Belts or V-Ribbed Belts include H, J, L, M, and PK. If the cross section is unspecified belt angle, then width and length need to be considered. Typically, both the section designation and number of ribs require specification and belt-pulley matching for V-belts and V-ribbed belts. A double-sided V-belt has a V-profile on both sides of belt and a hexagonal cross section. With a cogged V-belt, the inside of the belt is notched for gripping. Sometimes, there is an X designation in the belt specification. Variable speed V-belts and V-ribbed belts are wider than standard belts. As their name suggests, they are designed for variable-speed drives. Anti-static V-belts belts help prevent buildup of static electricity. Truly endless belts are not spliced, but are instead manufactured as one closed loop. Open-ended belts come in a roll and may be cut and spliced to desired length and number of teeth. V-belts and V-ribbed belts may be banded together for multi-sheave drives. The number of bands or ribs should be specified for products with multiple bands. Some V-belts and V-ribbed belts are reinforced. Typically, the reinforcement takes the form of cords or bands running circumferentially along the belt near the top or at the pitch line. V-belts and V-ribbed belts that are made of fiberglass, polyester, and steel are also available.